We don't normally wade into politics here at Home Theater Review, but there's unfortunately no way to get around it, given how two of the Trump Administration's main economic policies thus far stand to impact the United States consumer electronics (CE) industry. And the state of the CE industry is certainly a subject that we wade into often. The policies in question are the tariffs that the U.S. government recently issued on about $50 billion worth of imports from China (with more potentially to come) and the already enacted tax "cuts," each of which has been met with a decidedly different reaction from the business community overall. The administration's constantly shifting tariff proposals started out taking aim at China, were recently stepped up to include Canada and other U.S. allies, and may have changed course again by the time this story is published. In any case, what's been proposed thus far has been widely slammed by economic experts across the entire political spectrum, as well as by the Consumer Technology Association (CTA). The tax cuts, on the other hand, have received a much more mixed reaction and were even praised by the CTA. The danger posed to the CE industry is by far the clearest when it comes to the administration's decision in late May to go ahead with a proposal that would impose an additional 25 percent duty on $50 billion in products from China. Flat-screen TVs were initially expected to be included in the plan. But the list of imports from China that was announced by the Trump Administration June 15 wound up not including TVs... or iPhones and other cellphones, for that matter. The list did, however, include some components and parts that are used in today's TVs and other electronic devices. And the administration also announced on June 18 that another $200 billion of Chinese goods are being looked at for additional 10 percent tariffs. So, who the heck knows what products will eventually be tossed onto the list that could harm the CE sector when all is said and done? Of course, a significant number of TVs and other CE devices continue to be made in China, regardless of where the product's manufacturers are based. And there is little chance that a sizeable number of CE companies will start making most of their devices in the U.S. anytime soon because of the higher labor costs here vs. China and several other countries where some electronics are currently being made, including Mexico. There are--believe it or not--a relatively small number of electronic devices that are either made in the U.S. or will soon be made in the U.S. For instance, Taiwan-based Foxconn, which manufactures products for Apple and other companies, is opening a Wisconsin plant where it is expected to manufacture displays. Apple has also indicated that it's looking to further boost the number of its devices that are made in the U.S.
Also, Sharp Electronics, now a subsidiary of Foxconn, said at the NAB Show in Las Vegas in April that it planned to use the U.S. facility for its planned 8K TVs. However, a published report recently claimed Foxconn decided to scrap its plans to produce large displays in Wisconsin and will now only make small and medium-sized displays there. Apple and Foxconn didn't respond to requests for comment and Sharp outright declined to comment. There seems to be at least some irony in the fact that the inclusion of electronic device components including printed circuit boards (PCBs) for TVs--and not the finished TVs themselves--would seem to provide, if anything, yet another disincentive for TV and other device makers to manufacture products in the U.S. One of the main goals of the Trump Administration, after all, has been to supposedly boost the amount of manufacturing in the U.S. How ironic would it be if the current tariff plan for Chinese products ends up leading to even fewer products manufactured here instead? It wasn't immediately clear just how much of an impact the tariffs would have on the U.S. CE industry and the price of TVs and other electronic devices based on the list of products released on June 15. But Shawn DuBravac, president and founder of research company Avrio Institute, who also served as chief economist for the Consumer Technology Association (CTA), told me by email "While the initial list of impacted categories does not include goods like mobile phones and televisions, the additional tariffs will impact consumer tech in numerous ways." First, he said: "Trade barriers generally raise prices and reduce the quantities of goods and services. This in turn lowers the level of economic activity, reduces employment, and lowers income. Lower employment and lower income reduce the ability of Americans to buy goods and services, so I'd expect to see a reduction in discretionary spending, which would include less overall spending on tech." Next, he explained: "Because tariffs raise prices, higher prices could also crowd out spending. As a result, there's likely to be a spillover effect. If consumers have to pay higher prices for one good, it means they'll have less to spend on other goods." Next, he said, "A trade war negatively impacts sentiment, both of consumers and businesses, which will hinder consumer spending and business investment. Again, this will be especially felt on discretionary goods." He continued,"Because tariffs make certain goods more expensive, we'll import less of these products. We'll also export less because of the retaliatory tariffs. The list of products imported from China that will be subject to higher tariffs includes primarily parts and components that U.S. firms use to be more globally competitive. Import restrictions make the U.S. economy less productive and U.S. firms less globally competitive. Moreover, China imposed retaliatory tariffs on U.S. exports, which include items like new vehicles and airplanes. These categories include significant tech in the finished product. These tech categories will be directly negatively impacted by the reciprocal tariffs." Additionally, he pointed out that "businesses will spend time and money trying to identify alternative sourcing. There is a real cost to complying with new regulation and trying to find new suppliers. Moreover, supply chains have built in the most cost effective and efficient way, and finding an alternative means finding one that is by definition more expensive and less efficient." At the end he stated that "China is part of deep global supply chains. About half of the value-add in the listed categories comes from China, while the other half comes from trading partners and even from firms in the United States. So, these tariffs will directly negatively impact some U.S. firms." Paul Gagnon, IHS Markit executive director, research and analysis-Technology, Media and Telecom, said on June 18 that he was "still evaluating" the list of products impacted. But, based on what goods were included on the June 15 list of tariffed items, he said: "Since almost no TVs are assembled in the United States but rather in Mexico and China, it wouldn't seem to have a big impact. What is unclear is how sets assembled in Mexico would be treated, but under existing NAFTA regulations, they shouldn't incur an additional tariff or impact the final cost much." The press office at the Office of the United States Trade Representative didn't respond to a request to clarify that and other aspects of the tariff policy, such as whether TVs or cellphones have been taken off the table completely for future tariffs. "The Trump Administration's proposed tariffs and China's announced retaliation will hurt commerce, businesses and consumers," CTA President and CEO Gary Shapiro said in a CTA press release several months ago. 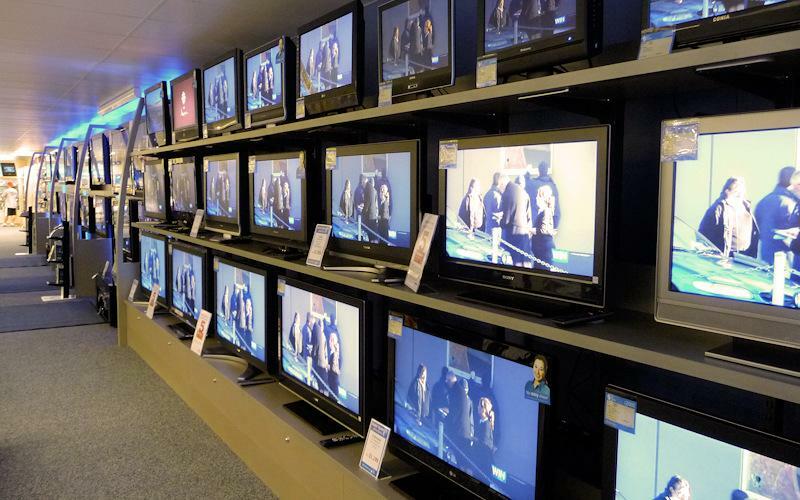 Noting that TVs were singled out by the administration as one of the largest proposed categories for the tariff, he said: "This staple of brick-and-mortar retailing makes no sense given the president's recent concern for their economic viability. But in the big picture, all these proposed tariffs and China's equivalent response are a poison pill to U.S. manufacturing, production, our innovation economy and American pocketbooks.... We must resist tariffs that would jeopardize more than two million American jobs associated with digital trade and could cost the U.S. economy $332 billion over the next ten years." The statement that CTA released on June 15, after the new list of products was released, indicated that the updated China tariff plan wouldn't be quite as horrible as the original one, but would still end up costing the U.S. plenty of jobs and dollars. "The economy will respond to the president's tariff agenda by increasing the cost of goods that people use every day, harming the U.S. economy and sinking the stock market," said Michael Petricone, senior vice president of government and regulatory affairs at CTA, adding: "Imposing tariffs on Chinese goods could cost Americans hundreds of thousands of jobs. The tariff on $50 billion in goods being imposed today is no exception. And the anticipated retaliation by China will escalate the U.S.-China trade war and reduce U.S. gross domestic product by nearly $3 billion," based on a CTA and National Retail Federation (NRF) study on the initial White House tariff proposal. We queried all the major TV makers for their thoughts on the administration's tariff plans and clarification on where they currently manufacture their TVs. But none of them would comment for this story. IHS Markit recently analyzed 2017 U.S. International Trade Commission data and found that about 51 percent of U.S. imported TVs came from China in 2017, with about 40 percent coming from Mexico and the rest coming from countries including Thailand and Vietnam, according to Gagnon. Many TVs are currently still "cheaper to produce in China than they are to produce in Mexico," he said in a phone interview. But if the tariffs on China-made TVs would have gone forward, at least certain manufacturers would have probably started shifting their production to Mexico, he said. But Gagnon pointed out: "Of course, that would come with a higher cost and the product margins on TVs aren't notoriously good. So, it would have an impact." Based on bill of materials (BOM) costs now, it "would be difficult to absorb that cost in all but the most high-end" of TVs that are 55-inch or larger 4K models, he said. However, he said, "most TV brands use those higher-profit TVs to offset the break-even or the loss even on some of the smaller TVs." Exactly how much of an impact there would have been on TV pricing if the tariffs included TVs was hard to say, because, "on a per-SKU basis, there can be quite a bit of variability in terms of the profit margins for those sets, and we don't actually track that in detail," he said. But running a general cost model for a few different screen-size configurations, it seemed that, in the case of "something like a 43-inch kind of mainstream 1080p LCD TV, the brands generally break even or even lose a few percentage points on that based on the most recent data calculating out things like panel prices and other set costs," he said. Up until now, there's been about a $10 tariff on a $269 43-inch 1080p TV from China, he said. That tariff would have gone up to about $70 for that same product shipped from China and that is "not sustainable," he said. Labor costs have been declining in Mexico, so that's one advantage for TV makers to select that country for manufacturing. And there has indeed been a growing percentage of TVs sold in the U.S. that are now coming from Mexico compared to years past. Because LG and Samsung are manufacturing at least some of their higher-end TVs in Mexico, it's possible those companies could benefit from tariffs, at least on a short-term basis, Gagnon conceded. But he was quick to add "Long-term, most brands...would relocate their supply chain" from China to Mexico if there was a tariff imposed on China-made TVs and "then everybody would be on a level playing field once they get everything set up and are running smoothly and efficiently." Chinese brands TCL and Hisense already have factories in Mexico also, but "haven't been using them as much as the factories in China because they're less efficient," for now anyway, he said. In general, it still costs more money to manufacture TVs in Mexico than China, according to Gagnon. One reason why is that Mexico requires all the main TV PCBs containing the processor and memory to be produced in Mexico for TVs that are assembled in Mexico, he pointed out. On a plus note, he pointed out, "there wouldn't be a tariff at all if it was assembled in Mexico," thanks to NAFTA. But, let's not forget that the Trump Administration has threatened to pull out of NAFTA if Mexico won't negotiate better terms for the U.S., and the U.S. has proposed tariffs on Mexico now also. And then there's also the little dispute over the wall that U.S. taxpayers are far more likely to pay for than Mexico. So, who's to even say that the relationship between Mexico and the U.S. won't deteriorate under the Trump Administration to a point at which it is no longer even possible to import TVs from Mexico into the U.S.? Could Black Friday Become Bleak Friday? If the tariffs had been imposed on China-made TVs, the upcoming Black Friday would have certainly looked at least a little different than usual. But Black Friday may still be impacted to some degree based on the finalized tariff plans. Had TVs been included on the list of tariffed products, what you might not have seen as much of would be "the super-cheap 32-inch and 40-inch and the 43-inch and the 50-inch sets because, number one, they don't have the profit margin on those sets anyway--the retailers or the brand--to be able to still keep those at an attractive price while absorbing the cost of the tariff," Gagnon said. What we would have seen would have been "more of those promotions focused on the larger screen sizes, like 55-inch and 65-inch," he said. That wouldn't have been that huge of a deal because, after all, "we're seeing it anyway just because the market's evolving" that way, favoring the larger screens as prices have come down, he said. Despite being a critic of the proposed tariffs, CTA's Shapiro enthusiastically supported the administration's tax law. "We could not be more pleased the president has signed this bill into law," he said in a news release, adding: "American entrepreneurs can now enjoy much-needed tax relief and savings as part of a revitalized and reinvigorated tax system. With a healthier approach to taxes, businesses of all sizes across the country will now be able to take advantage of additional economic opportunities, bringing our communities and our broader economy headlong into a brighter future." He added that the tech industry "looks forward to the innovation and economic growth this bill will bring" to the U.S. But the tax law certainly stands to help some CE companies and people a lot more than others. Sure, huge companies within the CE sector, including Apple and Samsung in manufacturing and Best Buy in retailing and the top executives at those companies, stand to be helped a bundle by those tax reductions. But, many folks in the CE industry--just like with the U.S. population in general--stand to benefit only slightly and only in the short term from the new tax law, or not at all, including employees who aren't at the top of the ladder at those large companies. For starters, the tax cuts don't much help small CE businesses. Despite the 20 percent pass-through/flow-through deduction so widely hailed as a boost for small businesses, it's actually much larger businesses that apparently stand to reap the most benefit from it, according to published reports. And at least some mainstream businesses from Main Street America apparently don't even qualify to take advantage of it because they either don't make enough money or because they are in a category including the services sector. Eliminated by the new tax law, meanwhile, are write-offs for entertainment that are often used to help develop new business. How can a small custom installer grow if it can't cultivate new business? State and local taxes (SALT), meanwhile, are no longer deductible above $10,000 when paying one's federal tax bill thanks to the new law. Therefore, people making about $200,000 to less than $1 million who own meaningful real estate will have less money to spend in high-taxed states including Connecticut, California, New Jersey, and New York. And, of course, that likely includes at least some CE industry folks. Plus, many of the people who work in the CE sector and own homes in those high-taxed states losing much of the deduction stand to be shafted because they are likely paying more than $10,000 a year in property taxes. Let's also not forget that a key component of the tax law was the elimination of the individual mandate to buy health insurance, which stands to further cripple the Affordable Care Act and significantly boost the price of health insurance for millions of Americans next year and beyond. At the same time, there is also now a higher threshold to get a deduction from medical expenses. This will further hurt many employees within the U.S. CE industry, especially if you factor in freelancers and part-time workers (like yours truly) who don't get health insurance via a full-time job. • With Prices Falling, Why Aren't More People Getting Into Specialty Audio? at HomeTheaterReview. • Evolve or Die: The Changing Face of the CE Retail Landscape at HomeTheaterReview.